MICHAEL A. VENTRELLA: Way back in the 80s, I started Animato!, a magazine dedicated to animated movies. Through that, I met many great animators and writers, including Jerry Beck. I was familiar with Jerry from his book THE WARNER BROTHERS CARTOONS, and he later became a regular contributor to Animato! Things were so much different then. Animation was not treated seriously, even by film critics (with a few exceptions). Jerry’s book was a light in the darkness. Jerry later went on to organize animation film festivals, write more books and articles, and even work at Nickelodeon for a time (where he gave me a tour and a Ren and Stimpy t-shirt I still have). He’s now considered one of the top experts in animated films in the world (if not THE top expert). This is a blog about writing. Usually I cover fiction (since that’s what I mostly write these days), but it’s my blog, and I can interview whoever I want! So there. Welcome, Jerry! You’ve managed to create a nice career for yourself as one of the top animation experts in the world. How did you first become interested in animation? 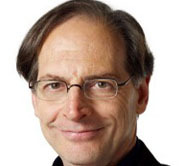 JERRY BECK: I loved comic books as a kid and used to draw all the time. When I was in high school I was hoping to become a professional cartoonist some day. I also developed a healthy interest in movies and at some point realized that animation was a convergence of both cartooning and movie making. So I looked into becoming an animator and went to SVA (The School Of Visual Arts) after graduating high school. VENTRELLA: I had always been interested in animation, but got hooked after taking a course in college from animator Steve Segal, using Leonard Maltin’s OF MICE AND MAGIC book. I understand you were involved in that book. How did that come about? BECK: First, let me acknowledge Steve Segal, a good friend of mine – and an incredible filmmaker. I think I met Steve when I was taking a college course taught by Leonard Maltin at the New School for Social Research in New York. At the same time (in the mid-1970s) that I was attending SVA, I took an animation history course Leonard was conducting. It was a real, for credit, college course. Leonard and I became good friends from that time onward. Leonard had already written THE DISNEY FILMS and THE GREAT MOVIE SHORTS – but he wasn’t planning to write a book about animated cartoons. Yet, here he was teaching a class about its history – and there weren’t any books on Hollywood cartoons out then (with the exception of several Disney books, Joe Adamson’s Tex Avery book and Leslie Cabarga’s FLEISCHER STORY). In those days before the internet, there was hardly any information on animators in print form. Somehow he came around to the idea of doing a book about it – and as I was an instigator, he asked me to be his “research associate” on the project. I had already started compiling, on my own, what would become the filmographies in the back of the book, so I already had a head start. VENTRELLA: Soon after, your first book came out (THE WARNER BROTHERS CARTOONS), written with Will Friedwald. It catalogued all the WB cartoons and is a wonderful resource tool, even if it had no pictures. How were you able to research it, given how difficult it was to see many of those films in those days? BECK: Will Friedwald – who has gone on to become a jazz music historian with several notable books and writer for The Wall Street Journal – was 14 or 15 when he started hanging out at Leonard’s class back in the 1970s and I enlisted him to help me compile my cartoon filmographies. After finishing OF MICE AND MAGIC, Will and I got the idea of collecting our Warner Bros. cartoon research and notes into a book. True, we didn’t have DVDs or You Tube to help us to research the cartoons – but we did have access to 16mm film prints and we were plugged into a network of collectors who would screen films for us. I have a pretty large collection of 16mm prints to this day. VENTRELLA: How did you get the book published? BECK: I think we did a few years of our Warner Bros. filmography – I seem to recall it was several years of the 1940s – and sent them to Scarecrow Press on a lark. They were immediately interested and we had a book contract right away. A lot of people like that book. To me it is “amateur hour”, sort of a mess. But it was a great way for me to learn what to do and what not to do. Spent the next several years trying to re-do the book, re-write it and get permission from Warners to use pictures. I succeeded in doing that in 1988 and a revised version, called LOONEY TUNES AND MERRIE MELODIES: A COMPLETE ILLUSTRATED GUIDE TO THE WARNER BROS. CARTOONS came out in 1989. VENTRELLA: Do you approach publishers these days with ideas for books or do they approach you? BECK: Works both ways. After establishing myself with the first Warner Bros. book, I started getting publishers coming to me – first to do a Tweety & Sylvester book, then most of the other character based books (The Pink Panther, Nicktoons, the Art-Of books). I pitched several books like THE 100 GREATEST LOONEY TUNES and THE ANIMATED MOVIE GUIDE, but most of my books came to me via the publishers. VENTRELLA: What’s been your best seller? BECK: That’s hard to say. I don’t always get the sales figures, believe it or not. I know THE HANNA BARBERA TREASURY sold very well. 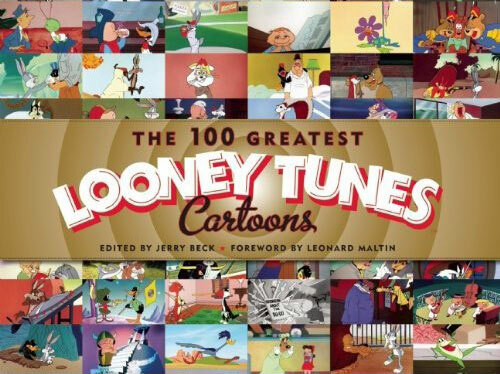 So did THE 100 GREATEST LOONEY TUNES. I’ve never had any publisher complain about sales and you’ll note I’ve worked with several publishers more than once. 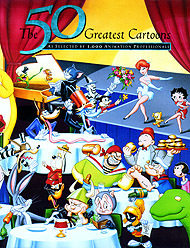 VENTRELLA: You interviewed many animation experts for THE 50 GREATEST CARTOONS book. Are there any cartoons you were upset that are in the book that, in your opinion, don’t deserve to be there? BECK: The book is supposed to be a consensus of expert opinion, so I’m pleased with most of the choices in that book. Is FELIX IN HOLLYWOOD the best Felix the Cat cartoon? Probably not. But it was the easiest to see at that time. There probably should have been a Koko the Clown cartoon, and there are probably a dozen Warner or Disney cartoons that could have made the cut. VENTRELLA: How were the films chosen for THE 100 GREATEST LOONEY TOONS CARTOONS? BECK: Thanks the internet, we were able to poll cartoon fans via my blog (Cartoon Brew) and several other sites and counting up the votes was probably the hardest part of putting it together. We gave special consideration to a host of animation historians, experts and writers and requested their lists of favorites. VENTRELLA: And why did you choose that title (since Merrie Melodies were also included)? 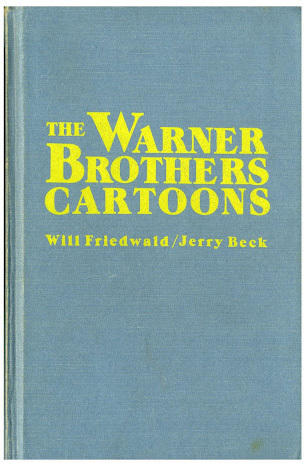 BECK: The book was officially licensed through Warner Bros. and to them, the series titles Looney Tunes and Merrie Melodies mean the same thing. That’s true of general public perception. It’s easier to sell… though I’ve often thought we could do a sequel called The 100 Greatest Merrie Melodies. VENTRELLA: Considering the classic theatrical animation directors, who is your favorite? BECK: Bob Clampett – though Chuck Jones and Tex Avery would follow right behind. Friz Freleng, Frank Tashlin, “Fleischer Studios” and Ward Kimball would be near the top of the list too. But Clampett made very few weak cartoons – all are pretty strong – and unlike Avery, they are really unpredictable. VENTRELLA: My tastes match yours, then. What great animation has been vastly overlooked in your opinion? BECK: Gosh, there are so many important aspects of the history that are over looked. The silent and early talkie era needs more attention, for one. My favorite “overlooked” animation is the post-UPA era, like the Gene Deitch Terrytoons period (1956-1958) – which spawned Flebus, Tom Teriffic and Sick Sick Sidney the elephant among others – and the oddball Paramount cartoons of the 1960s. There is some bad stuff in there, but the good stuff is pretty incredible. VENTRELLA: You’ve released dozens of books on all sorts of animation except Disney. Why not? BECK: Mainly because they don’t need me. There are dozens of great Disney historians doing great work – J.B. Kaufman, John Canemaker, Charles Solomon, David Gerstein, Michael Barrier and others. I like to research the studios that don’t have their own archives (like Disney does). Warner Bros., Lantz, Terrytoons, need their champions and cheerleaders. I like to remind people that animation isn’t just Disney. VENTRELLA: Of which book are you most proud? BECK: That’s hard to say. LOONEY TUNES AND MERRIE MELODIES was an accomplishment at the time – and it’s certainly the one book of mine I use over and over again to this day. THE 50 GREATEST CARTOONS has lots of fans. THE HANNA BARBERA TREASURY is the only book that came out better than I thought it would be while working on it. I really like the two Ultimate Guides I did for DK (Looney Tunes and The Pink Panther). 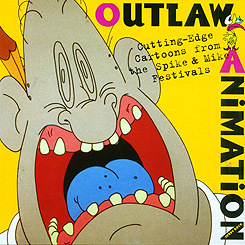 OUTLAW ANIMATION is a book many I’ve gotten great feedback on over the years. I’m proud of my involvement in OF MICE AND MAGIC and that I was able to loan assistance to many authors (friends and colleagues) on their books. Sorry, I have no one answer for this question. VENTRELLA: Many of your books are not necessarily for the animated film buff, but for the general public that has a passing interest. Which would you recommend for those who want a deeper analysis? BECK: Deeper analysis?? Cartoons are fun – and I try to impart that in my projects. I want the general public to see these films as I do. 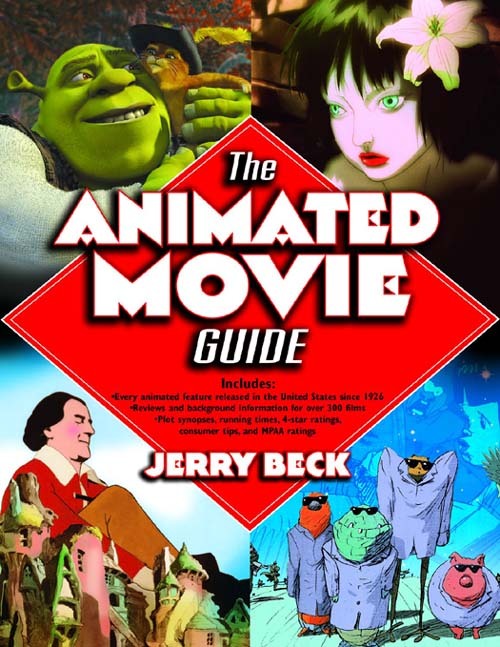 THE ANIMATED MOVIE GUIDE (which I am also very proud of – I forgot to mention that before) has a lot of good information and analysis in it. I’ve also been happy to hear that a book I edited and compiled, ANIMATION ART (my only book to be reviewed in The New Yorker! 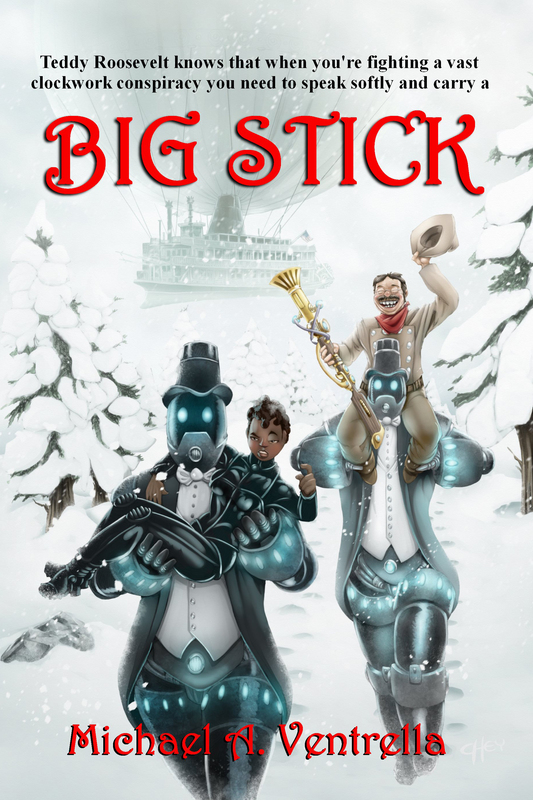 ), has been adopted by animation professors as a text book. I recommend these two for more hard-core info. VENTRELLA: You’ve overseen quite a few DVD releases of classic films. What is still out there that you want to see released? BECK: I’d like to see the Fleischer cartoons restored and released properly. Betty Boop, Color Classics, Talkartoons, Screen Songs, even Animated Antics and Stone Age cartoons, everything. It’s a crime these aren’t available as they could – and should – be. The MGM Tex Avery cartoons are also not yet on DVD. At the other end of the spectrum, I think the Terrytoon library (Mighty Mouse, Heckle & Jeckle, etc.) needs a proper release. On a purely personal basis, I’d like to see Columbia’s Fox & Crow cartoons on DVD. There are still many great Warner Bros. cartoons that haven’t been restored – and I’m chomping at the bit to see a release of the Famous Studios color Popeye theatricals. VENTRELLA: I completely agree, especially about Tex Avery. I was thrilled with the recent Droopy collection, but there are so many more that are missing. What are your favorite recent animated releases (features and TV shows)? BECK: “Adventure Time” on Cartoon Network I the best “new” thing on TV. I still enjoy “The Simpsons” and “Futurama.” I loved “The Fantasic Mr. Fox” from a few years ago and am delighted with all the stop-mo features we’ve had lately. I’m still waiting for a new hand drawn feature to blow everyone away and bring back that artform to theatres. I have other favorite films from recent years – ranging from “The Incredibles” to “Puss In Boots” (believe it or not). Nina Paley’s “Sita Sings The Blues” was superb. VENTRELLA: Once more, our tastes are similar. I was truly surprised with “Puss in Boots” so there’s no “believe it or not” there! Who is your favorite current animation director? BECK: Brad Bird. He’s got it all – and knows what he’s doing. I hope he returns to animation soon. In the independent world, Nick Cross is a person to keep your eyes on. VENTRELLA: Back when you first started writing about animation, we would be lucky to get one new animated feature film a year. Now there’s one every few weeks it seems. What happened in our culture to bring about that change? BECK: The great thing about the animation renaissance of the 1990s is that it allowed for the creation of many great films (“The Lion King”, “Toy Story”, etc.). Hollywood saw that audiences could take animation seriously – it wasn’t just cheap kids fare. Now every studio has jumped into it. I think that’s great. Every year we get a few great films (and a few duds) – and now the Academy of Motion Pictures Arts and Sciences recognizes the medium. What’s also exciting is that many animated films are blockbuster hits – cash cows for the studios. This insures the health of the art. VENTRELLA: What is it that makes a great animated film, and why can’t Hollywood produce more of them? BECK: Well, if I knew the secret of making great animated films I’d be making them myself – but I’d say it takes a filmmaker with a passion for the field – Brad Bird, Tomm Moore (“Secret of Kells”), even Wes Anderson. Hollywood doesn’t like to take risks and animation is always risky. That’s why Hollywood relies on formulas (musicals, fairy tales, CGI, Dr. Suess, etc.). But when one great filmmaker breaks trough, it can make a huge difference. What a fascinating career! And how far the animation industry has come from not being taken seriously to the echelon its at today. And I love how cartoons are timeless. My 9 yr old loves the Loony Tunes from the 1950s as much as any current cartoon. Cartoons are for everyone. Glad there are folks like Jerry who have helped make them so.